Its harder than ever to promote your business using Facebook. There’s a couple of forces at work to make it even harder for your business to get visibility in Facebook. Marketing Land recently quoted Will Cathcart, Facebook’s News Feed Director of Product Management: The number of Pages Liked by the average Facebook user has increased by more than 50% in the last year. This means the average Facebook user is seeing more stuff (‘noise’ if you like) in their news feed. That in turn means you have to up the ante to get visibility in your clients news feeds, but of course you also run the risk of spamming and being un-liked or ignored. This is not new in SEO circles either, because as online competition has ramped up over recent times, so has the ‘authority’ needed to return a commercially viable ranking outcome has also increased. Back to Facebook, and why its getting tougher for you as a business to get coverage in news feeds, it might also be because Facebook has been tweaking their feed filter algorithms to reduce feed ‘noise’ – that means your ‘advertorial’ post gets filtered. 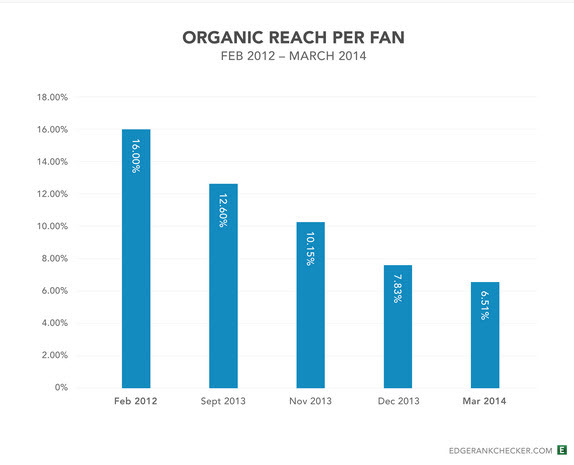 This data from Edge Rank Check supports this, showing ‘Organic Reach’ per Fan in decline over the last two years. Finally read Eat24’s (a US food delivery service) very public spit at Facebook and its threats to delete its business page with 70,000 likes. Looks like Facebook and Google are both pushing to re-aligning their ‘traditional free services, to get more profits through advertising. http://succinctideas.com.au/wp2/wp-content/uploads/2014/08/si-colour-logo-300x137.png 0 0 pete http://succinctideas.com.au/wp2/wp-content/uploads/2014/08/si-colour-logo-300x137.png pete2014-04-07 09:00:222014-04-07 09:00:22Its harder than ever to promote your business using Facebook.